The star anise (Illicium verum) is native to China and Vietnam. The beautiful star-shaped spice comes from a tree that is a member of the magnolia family. Star anise is harvested when green and allowed to dry in the sun to develop its warm flavor that is often described as a blend of licorice, clove, and fennel seed. Star anise is also used medicinally. It is important to note that Chinese star anise that is used in food is different than Japanese star anise which is poisonous. Star anise provides almost no calories and no significant carbohydrates. The glycemic index of star anise is zero. However, teas and other beverages or foods that contain star anise may provide both calories and carbohydrates depending on the preparation method. Star anise contains zero grams of fat. Star anise is not a source of protein. Star anise is not likely to provide any vitamins or minerals as it is used in very small amounts. Many people use star anise for its purported health benefits. In fact, many alternative health practitioners promote the medicinal uses of the star-shaped seed. Star anise has been used in Chinese medicine for thousands of years. However, there is not a lot of strong evidence to support many of the most common uses—although there are a few published reports of potential benefits. For example, a study published in Phytotherapy Research demonstrated that star anise may have microbial properties and might be effective against bacteria, yeast, and fungal strains. Another study published in the Journal of Pharmacognosy and Phytochemistry suggested that polyphenols in star anise extracts provide antioxidant benefits. An overview of herbal treatments published in the Journal of Evidence-based Complementary & Alternative Medicine explains that star anise contains an ingredient called anethole, which gives this spice its distinctive flavor. Anethole is used in Chinese medicine to treat rheumatoid arthritis and other conditions. The study also notes that the shikimic acid in star anise is an ingredient in oseltamivir (Tamiflu)—a widely-used pharmaceutical treatment for the flu. There is insufficient evidence to support the use of star anise for these conditions. Additionally, star anise may be dangerous in some situations. Star anise is sometimes used to treat infant colic. Chinese star anise tea has a long history of use in many cultures to calm babies. However, health sources and published reports advise extreme caution. Japanese star anise (Illicium anisatum L), has been documented to have both neurologic and gastrointestinal toxicities. Unfortunately, Chinese star anise tea is sometimes made entirely or partially with Japanese star anise and has caused cases of adverse neurologic reactions in infants. Researchers have recommended that more strict federal regulation of the import of star anise into the United States is warranted. Additionally, they warn that star anise tea should no longer be administered to infants because of its potential danger in this population. Star anise is generally recognized as safe by the United States Food and Drug Administration in amounts typically found in food. But there is not enough evidence to determine its safety when used medicinally. Pregnant women and women who are breastfeeding are advised to avoid star anise. Where can I buy star anise? 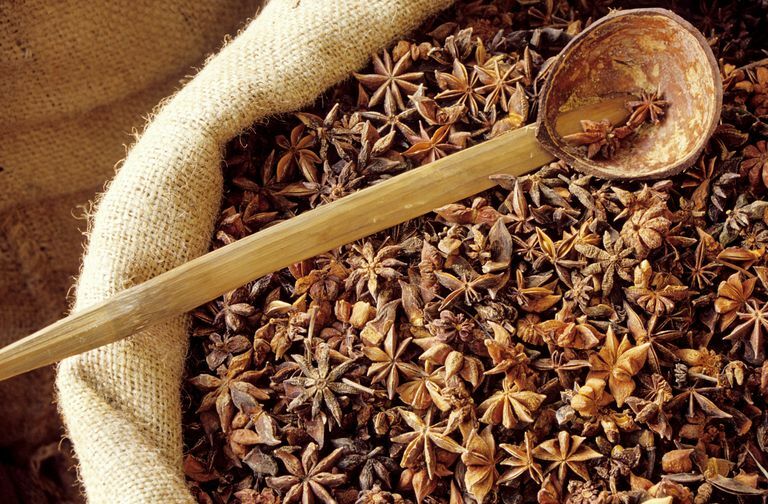 Your local supermarket may carry whole or ground star anise in the spice aisle. But if you are looking for fresh star anise (recommended for its flavor) you are only likely to find it at Asian markets, natural food stores, and even at mail-order spice houses. Is anise and star anise the same thing? No. Anise comes from a different plant and has a flavor that is usually described as spicier than star anise. Both seasonings are often used in spice blends. What is the best substitute for star anise? Aniseed can be used instead of ground star anise, but you should use about twice as much. Can I eat both the pod and the seed of star anise? Yes. Cooking sources note that you can grind both the pod and the seed for use in recipes. How should I store star anise? Star anise should be stored like your other dried spices in an airtight container away from heat and light. How long does star anise last? If you buy the whole star anise star it will likely stay fresh for about two years. However, ground star anise lasts about one year when properly stored. Cooking sources explain that you can check whole star anise by breaking off a point and squeezing it until the seed pops. If you don’t immediately smell the distinctive aroma, it is no longer good. One of the most common ways to consume star anise is in tea. For example, some people blend green tea with a cinnamon stick and two to four whole star anise and let it steep for about two minutes. You should remove the star anise and the cinnamon stick before drinking. Star anise can also be used in soups, stews, and braised dishes. Keep in mind that a little goes a long way, so add less when first cooking with the spice. Star anise is also sometimes used in alcoholic beverages, desserts, and baked goods. Star anise is not known to interact with foods, supplements, or medications. But it is always smart to check with your healthcare provider before consuming it. If you have a spice allergy, you may want to avoid star anise until you know that it is safe for you. Additionally, those with birch tree or mugwort weed pollen allergy may have a reaction to star anise.